In anticipation of getting back to doing my full-colour, regular cartoons again, I have been working up “characters” for the new cats in the ensemble cast: Pyret, Alfred and Logan. You have seen some of the preliminary sketches of Freddy and Logan already. 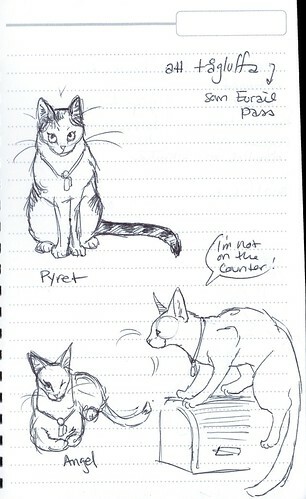 I also worked up a sketch for Pyret. Someday I’ll have to finish this one in colour. I love your drawing cuz! They are wonderful! I love your Pyret drawing!